Something is still rotten in the Borough of Swindon and, (as most honest people know), you can’t bury a bad smell and gangrene doesn’t go away if left untreated. Six months after www.talkswindon.org members publicly asked Swindon Borough Council to explain why its Director of Business Transformation was a Director of Digital City (UK) Ltd before Council leader Roderick Bluh and his fellow Tory Councillor Mark Edwards decided secretly to lend the fledgling WiFi company £450,000 of public money, the town is still waiting for a believable explanation. I’ve become a little tired of waiting for the truth to be told and, to be honest, I think the town is rapidly losing patience with the failure of the Digital City and Swindon Council parntership to deliver on its joint promise of a borough-wide free-to-access wifi system. Although the scheme was due to be completed by April of this year even the pilot scheme in Highworth remains unfinished and, after 9 months of commercial operation, Charley Morgan of the Swindon Advertiser reports that it only has ‘about 40′ paying customers. To date, Councillors who are members of Rod Bluh’s Cabinet have repeatedly failed to satisfactorily answer many basic questions about their WiFi scheme, preferring instead to be obfuscatory, evasive or to simply ignore the question and the questioner. ‘Political embarrasment’ seems the most likely reason for their behaviour, which leaves those of us interested in the ‘Wifi’asco’ (as it is often called), little choice but to submit Freedom of Information requests to get answers to simple and reasonable questions. There are many intriguing and unanswered questions surrounding this particular pet-project of Council Leader Roderick Bluh, not least of which is the subject of why the Director of Business Transformation at Swindon Council, Mr Hitesh Patel, became a Director of Digital City (UK) Ltd before he co-authored a ‘Cabinet Briefing Note’ advising on the provisioning of a £450,000 loan to Digital City (UK) Ltd, but failed to tell Councillors he was already a Director of that company, and subsequently denied being a director of the Company when publicly challenged 5 months later. I think it’s about time Swindon Borough Council started being completely honest with the tax-payers that have funded this scheme and, although I’d prefer to see the Council volunteer the answers to questions that are already several months old, I suspect Cabinet Members and Directors would rather pull their own teeth out before publicly exposing themselves to even more WiFi ridicule. To this end I have submitted the following Freedom of Information request via the excellent www.whatdotheyknow.com FOI service provided free of charge by www.mysociety.org. 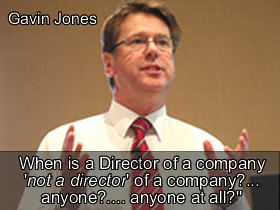 Investigation carried out or commissioned by the Chief Executive (Gavin Jones) and/or the Deputy Chief Executive (Celia Carrington)into the Directorship of Digital City (UK) Ltd held by Swindon Borough Council Director of Business Transformation Mr Hitesh Kumar Patel. 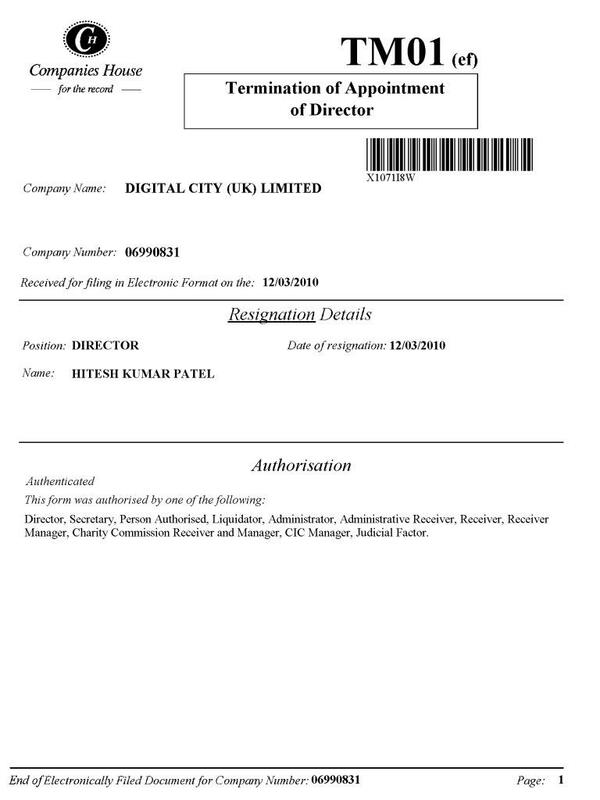 Companies House records indicate that Swindon Borough CouncilDirector of Business Transformation, Mr Hitesh Kumar Patel, became a Director of Digital City (UK) Ltd on the 15th of September 2009. I can find no public record in existence which indicates Mr Patel disclosed his Directorship to Swindon Borough Council before it entered into a ‘public/private partnership with Digital City (UK) Ltd despite Mr Patel co-authoring a ‘cabinet briefing’ note on the 12th of October 2009 concerning the provision of a Loan to Digital City (UK,) Limited for the Purpose of Establishing Wi Fi Network Across the Borough of Swindon. 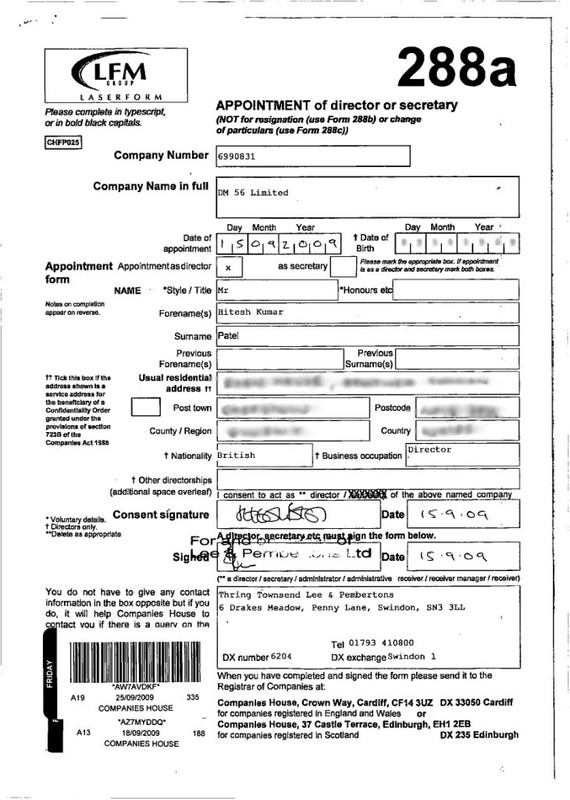 On the 12th of March 2010, (two days after his directorship was publicly denied) a ‘TM01′ form, (termination of Directorship) was electronically submitted to Companies House terminating Mr Patel’s directorship at Digital City (UK)Ltd.
1.The issue of when Mr Patel became a Director of Digital City. 2. 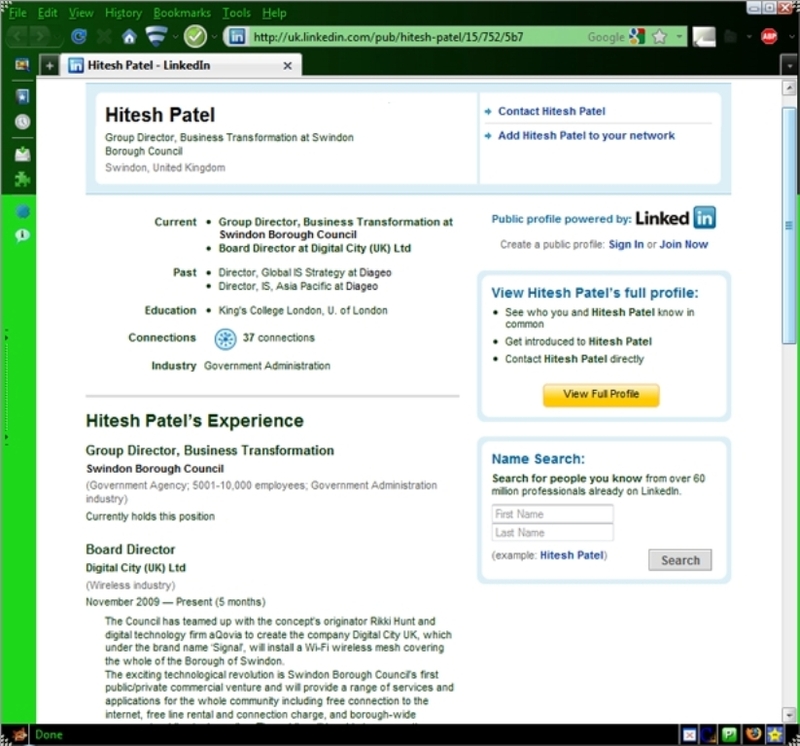 Why Swindon Borough Councillors were misadvised that Hitesh Patel was not a Director of Digital City (UK) Ltd when the public records and Patel’s own Linked-In profile clearly show that he was, and that he knew that he was. 3. That Hitesh Patel was a Director of Digital City ahead of the formal decision taken by Swindon Borough Council to lend £450,000 to the company. 4. Whether Mr Patel’s Directorship of Digital City (UK) Ltd compromised his position as ‘prime negotiator’ with Digital City (UK) Ltd,(with Patel being on Swindon Borough Council’s side). 5. Whether Mr Patel’s undiclosed Directorship at Digital City (UK) Ltd effectively pre-assumed the future decision making of the Swindon Borough Council Cabinet members regarding the loan of £450,000 to the company and the council becoming part-owners of the company. Please supply a copy of the report.